The Secret Life of Oscar Wilde was written by Neil McKenna and published in 2004. I can never resist books about Oscar Wilde and had never heard of this one until fairly recently. This is not so much a biography of Wilde though as a biography of Wilde’s private life, specifically his homosexuality. The author begins by explaining that he wanted to discover more about this side of Wilde’s life, which of course ultimately led to his downfall. When did Wilde first realise he was attracted to men? Why did he get married? Did his wife suspect anything? Why did he not take the advice of his friends to go abroad when his court battle against the Marquess of Queensberry collapsed and he faced charges of ‘gross indecency’? The book is also about attitudes to homosexuality in the Victorian age and how Wilde was rather brazen in the manner in which he swam against the tide and often shockingly open about his sexuality (the author drawing on new documents and witness statements from Wilde’s infamous trial that had recently come to light). The Secret Life of Oscar Wilde is loose with the Oscar Wilde story as we generally know it at times and this is both a strength and a weakness here. A strength is the fact that the book challenges many of our assumptions about the subject. McKenna, for example, doesn’t portray Wilde’s final years in exile on the Continent as lonely and sad like other Wilde biographies do. He says Wilde attracted the Victorian version of groupies and often had a whale of a time. ‘His life on the boulevards was far from a journey through Hell, more a kind of louche Heaven.’ It’s fun to have a new interpretation or slant on some areas of Wilde’s life but the book does occasionally stumble, setting too much store on Sir Edmund Trelawny Backhouse, who claimed to have been a lover of Wilde and Lord Roseberry, and sometimes becoming a bit obtuse in attempting to find a gay subtext in everything Wilde wrote or said. The book does an excellent job though in taking you back to the Victorian era, especially the more secretive underbelly that Wilde found himself drawn to in the end. The author says the trigger for this was his relationship with Lord Alfred Douglas (‘Bosie’) as Wilde felt connected to Douglas on an emotional level, a first in his relationships with men. Douglas introduced Wilde to the world of brothels and ‘rough trade’ and they were remarkably open about their affair despite the age in which they lived. The book says that homosexuality was regarded to be an aberration at the time, mad and almost Satanic. Never one to do things by halves, Wilde threw himself into the shadow world of Bosie with great abandon although, ultimately, it was the end of him. ‘I am a born Antimonian,’ said Wilde in De Profundis. The author explains that the Antimonians were ‘a sixteenth century sect of dissenters who believed they were God’s chosen people, the elect, predestined for salvation, and consequently they were not bound by conventional moral laws’. Apparently, gay people used codes at the time of Wilde to recognise one another, the wearing of a green flower a particular badge of identity. Wilde lent his support to The Order of Chaeronea, a secretive group of intellectual homosexuals who campaigned (furtively of course) to have laws changed. One interesting thing here is the suggestion that the establishment didn’t really care what people did in their private lives or if people were secretly gay. What they did care about though was the notion that gay people were forming societies and looking to change things. They didn’t like that at all. The theory here that Wilde helped write the 1893 gay novel Teleny is much more open to question than most of the stuff in the book – which is by the way a bit hit or miss but always quite interesting on Wilde’s works. The Picture of Dorian Gray was, according to the author, about Wilde’s duel lives while The Importance of Being Earnest had nagging characters as a comment on Wilde’s wife Constance. That second point is a bit dubious but it sums up the general spirit of The Secret Life of Oscar Wilde. The book was criticised for its often speculative nature but it’s part of the fun really. The term Greek Love was used by Wilde to refer to relationships between men and so any use of the word Greek in any Wilde book is forensically examined and picked over here. One thing I did find absorbing to dwell on here was Wilde’s attitude to life. He believed that happiness lay in immersing oneself in fantasy worlds like the arts, paintings and books. Reality was a dreadful alternative (especially if you had no money). I can see his point really. Given a choice between watching an episode of Star Trek or waiting for a bus in the rain I’d go for Star Trek every time. Wilde believed you had to turn your own life into a work of art and seek out pleasure to stave off the mundane boredom of the real world. His world came crashing down in the end though and Reading Prison probably wasn’t the most pleasure filled place to be sent to. Regarding the trial of Wilde and his feud with the Marquess of Queensberry (who, on a note of trivia, invented the rules of boxing), the author makes these passages absorbing – even if we are already familiar with this story. He does this by suggesting more of a wider conspiracy to have Wilde gagged and taken down a peg or two. It’s very readable and interesting although, like the book as a whole, not completely watertight all the time. 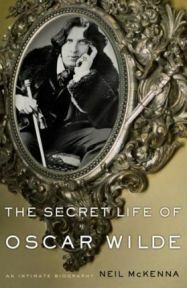 The Secret Life of Oscar Wilde will certainly not be everyone’s cup and tea, and there is much here that might have to be taken with a pinch of salt, but it’s an entertaining read that takes us down some interesting Wildean pathways. How much is true is open to question but the book itself is very readable. No Comments on "The Secret Life of Oscar Wilde"